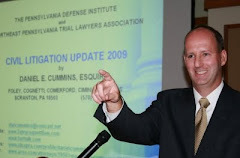 A great turnout is expected for the CLE seminar being put on by the Pennsylvania Defense Institute and the Northeastern Pennsylvania Trial Lawyers Association this Wednesday, August 18, 2010 at the Mohegan Sun Casino in Wilkes-Barre, Pennsylvania. Presently, there are approximately 60 confirmed attorneys or claims professionals planning to attend the seminar and the following cocktail hour at Breakers in the Mohegan Sun Casino. 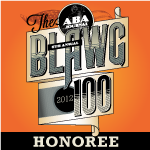 Also, another 20 or so judges from all around the Northeastern Pennsylvania region expected to come to the cocktail hour. The seminar begins with a 12:30 pm registration and will consist of a one hour Auto Law/Post-Koken Update by Attorneys Robert Panowicz and Daniel E. Cummins, a one hour Bad Faith Litigation Update by Attorneys Tim Lenahan and Suzanne Tighe, and a one hour ethics discussion on a variety of topics by an unbelievable panel of judges consisting of Third Circuit Court of Appeals Judge Thomas Vanaskie, Superior Court Judge Correale Stevens, Luzerne County President Judge Thomas Burke and Lackawanna County Judge Terrence Nealon. There will also be an exciting raffle going on at the seminar designed to encourage the attendees to visit, again and again, the many table vendors who will be at the seminar to advertise their services. These vendors have paid a fee to secure a table to advertise at the event and it would be nice to see them get a number of visitors to make the event worthwhile to them as well. Under the raffle, attendees will be permitted to submit their business card, or fill out a slip with their name and contact info to submit into a basket. At the end of the seminar, all of the entries will be gathered and winners will be chosen. The prizes include $50 Mohegan Sun gift cards (5 to give away), local Yankees baseball tickets, Phillies baseball tickets (2 sets to give away), and a $200 Mohegan Sun gift card. The Mohegan Sun gift cards can be used for the shops and restaurants and even to gamble at any time, including the night of the seminar. You can still sign up to come to the seminar and cocktail hour if you'd like. As noted, it should be a great event to get your CLE credits and to network with fellow attorneys, claims professionals, and members of the state and federal judiciary. Please contact me for any more info on the event and how to reserve your spot. I can be reached at dancummins@comcast.net.